Set the task of exploring a facet of a culture previously not experienced, I opened up to a type of research that prompts the researchers vulnerabilities (Ellis et al. 2011, 14.1.18) and cultural frameworks to gather insights typically unattainable. My field site being cosplay and its anime adaptions, I quickly realised that by immersing myself into the experience I felt vulnerable and certainly out of my comfort zone. Whether that be the idea itself as a daunting action, concealing your own identity as another’s for costume play, or whether it be the unfamiliarity with the field site itself, I was acutely aware that I was letting my feelings, thoughts, and vulnerabilities influence the way the project was migrating (Ellis et al. 2011, 14.1.3), in a way that other forms of research methodologies would certainly not allow for. This investigation into cosplay originally was rooted in personal experience, but when I found myself hesitating to participate I found myself redirecting towards a more niche area of study; whereby perhaps there was a middle ground to find, whereby I could create looks that were alike to the characters from Studio Ghibli films, designing them to look like everyday pieces or at the very least curating costumes from everyday pieces that I already owned. Could I find a way to interact with a culture I was trying to understand in a way that was part of my own cultural framework? Working in fashion retail and with a history of sewing projects behind me, could I take what I understood already and utilise it to imitate the feelings and processes associating with the action of cosplay? Furthermore, could I create a layered account of my experience by introducing my fondness and knowledge of anime produced by Studio Ghibli? These were all questions I set out to answer, and one that could only be facilitated by the means of autoethnography; a method whereby I could introduce an alternate voice amidst a construction of knowledge (Sturm, D. 2014). As I went on to have my first swing at cosplay, or whatever it was that I deemed a variation of it, I began to realise that the research project was as much about myself as it was about the topic; “..autoethnographies offer a diverse body of works, with many often producing essentially autobiographical accounts of the self as both researcher and the researched” (Kien, G. 2007). And so here I find myself, at a crossroads whereby I believe I have navigated down an alternate route, truly utilising my own cultural framework to gain a better understanding of other cultures around me. In translation, I will utilise the data I collect to create and curate wearable, everyday pieces that are cosplay, to a degree, and critically analyse the experience alongside further research into the area; a layered account (Ellis et al, 2011). The aspect to tackle now, I find, is distinguishing autoethnography as both a process and a product, a notion brought to my attention by both Ellis (et al, 2011) and Angus Baillie in our seminar conversation, and how they are to interrelate in this investigation. Ola mi amigos, time for another autoethnography project! Utilising autoethnography as an approach to research can reveal qualitative insights into areas that may go amiss with traditional research methodologies, made evident by the hundreds of BCM students to pass before me. I can particularly see how the process assists many in Digital Asia, encouraging students to view Asia as ‘another’ rather than ‘other’ through immersing themselves into the culture or point of interest. This week, we were tasked with selecting a specific area of Asian interest to become literate in, prompting an account of our experience with a topic, text, product, service or platform of our choosing, to be broken down into a field site, a data type, speculative research area, and a communication format. Now, if you ask me what the one thing of interest I have about Asia that I have yet to look into and better yet to barely begin to understand, its cosplay. I have always been aware of its existence and acknowledged its seemingly large following purely from interactions online, but with friends recently getting into it and my club having several interactions with the Universities’ Cosplay society, my interest has been peaked. Although, I was particularly curious to understand cosplay surrounding a broad spectrum of fandoms, but also that which surrounds styles adopted from Studio Ghibli. I’ll get to how I got to this point later in the blog, but growing up I didn’t get the chance to watch much anime at all, I was rudely informed only at the ripe old age of 20 that Winx Club was actually Italian and very much not anime (although it did apparently have a cult following in Japan in the 2000s). Despite this, in high school my two best friends agreed that we should all watch the others favourite movie. While I picked Gatsby and our friend Tom picked Casino Royale, we were very lucky that our beautiful friend Georgie showed us Howl’s Moving Castle as hers. It was the beginning of my love for Studio Ghibli films. I have seen it twice more since that first movie night, and I have seen a few other cult favourites over the years such as Spirited Away and Kiki’s Delivery Service to name a few. Each and every time I have fallen in love with the illustrations, the colours, the settings, and the ability of the films to transport you elsewhere. This may stem from many years of art classes growing up, or from my studies in Design throughout uni, but I can never let my mind pass over the images without admiring them. The thought of tackling cosplay in a project like this is daunting to me, and it isn’t necessarily the idea of dressing up that scares me but the act of putting yourself in a vulnerable state perhaps? It is definitely not the costumes themselves, as I have always been fond of them for their excessive nature and the likeness to the imagination. I taught myself to sew growing up, and I was forever making weird and wonderful pieces that weren’t practical for everyday use. Most of which I have never shown anyone. I am curious, nonetheless, of cosplayers confidence when in character – I will make a very generalised assumption that it’s the ability to be someone who you are not that allows it to bloom, but who am I to know for sure? This fear of vulnerability may be perfect for this particular project, especially with the intended methodology. Ellis and Bochner (2006) support autoethnography ought to be “unruly, dangerous, vulnerable, rebellious, and creative”. My interest in anime, similarly, most likely stems from an appreciation for illustration and art; I was always drawing growing up. Which brings us to the breakdown of this research project. I needed to set myself some guides as my mind does tend to wander when it comes to research, particularly ethnography. Cosplay + Anime: wearable pieces? Speculating that the fashion and aesthetic of anime often translates into cosplay which is a high level of commitment, is there a middle ground? Instagram account with vlog-style stories and photos to post. Photographs of alike finds, videos of creating processand/or blog posts to accompany. To kick the project into gear, I began by creating an Instagram account (@cosplaystudies) to detail all of my data in a curated means, and begin to work my way through the topic. I started by looking for inspiration and put my ‘feelers out there’ but trawling through s o m a n y hashtags across Pinterest, Instagram, and Tumblr to see what people were actually cosplaying as. I feel that I mustn’t let my own preferences get in the way of understanding cosplay as a whole, rather than a specific alley of the culture itself. A true testament to the ability of autoethnography, as Rachel E. Dubrofsky & Megan M. Wood (2014) dictate “privilege participation in the form of self-reflexivity and active fashioning of the self” can act as an extension of the data or rather as a constraint. A starting point nonetheless, there’s much more to be investigated. I am most looking forward to getting to what I hope to be a very tactile part of the project. Ellis C., Bochner A. P. (2006). Analyzing analytic autoethnography: An autopsy. Journal of Contemporary Ethnography, pp. 433. Growing up I had always had an interest in Asian culture, specifically anime. Not really, but I understand his enthusiasm. Just like any child my age I loved watching cartoons and the way each character had its own individual style and personality. In fact, I remember favouring certain cartoons over others based on their aesthetic quality e.g. ‘Courage the Cowardly Dog‘ > ‘Cow and Chicken‘. I remember eagerly anticipating Cartoon Cartoon Fridays with my siblings. On a few occasions we spent the whole day in our pyjamas, eyes glued to the TV. When I was around 11 I started watching anime that would appear on TV such as Sailor Moon and Mew Mew Power. Prior to them the only cartoon I had ever watched that was relatively ‘Asian’ was ‘Samurai Jack‘ which is for starters, an American animated television series. The difference in styles between these animations was pretty distinct; the Japanese animations were beautiful and noticeably more detailed and seemed carefully thought out, where each character had their own unique theme that distinguished them from the others. The animations I was used to were more simplified and were often not depicted in a fantasy world. One night, when I was 12, Hayao Miyazaki’s animated movie ‘Spirited Away’ (2001) came on TV. Immediately I was captivated. Everything from the music to the clothing, the architecture, the way the people were depicted and the food, it was all so unfamiliar to me, and that was why I loved it so much. For me, they were the most lifelike cartoons I had ever seen. Compared to the anime TV shows I had previously watched, Miyazaki’s characters did not have the typical ‘big-eyed, anime look‘. I remember thinking how mysterious and brooding, yet feminine, the character Haku was (in my 12 year old, pre-pubescent mind I would have probably described him differently). I also really liked the character Lin (Rin) who is cold and unmotherly to the main character, Chihiro, at first but then eventually warms up to her. I thought that was unusual of a female character to be that way to a young girl, but I liked it as it taught Chihiro to be independent and strong. After viewing these Japanese animations I was intrigued by them. Looking back on the films I grew up watching as a child, the disparity between Disney films and Studio Ghibli films was noticeable, particularly in relation to the portrayal of femininity. Out of the studio Ghibli productions I have only watched ‘Princess Mononoke’ (1997), ‘Spirited Away’ (2001) and ‘Howls Moving Castle’ (2004). However, despite my limited exposure to Miyazaki’s films, I noticed the portrayal of strong, powerful female characters whose actions would either result in the demise or triumph of their male counterparts e.g. Chihiro and Haku, No-Face and Chihiro, Sophie and Howl. They are ‘complicated, flawed and independent figures.’ Prior to this, the majority of animated films I watched were quite different, with the male typically rescuing the female from her seemingly doomed existence e.g. Cinderalla, Sleeping Beauty, Snow White, Rapunzel etc. I think this is because such films revolve primarily around romance and the prospect of marriage, especially the older Disney films. Studio Ghibli seems to portray the lead male and female characters as equals with a mutual respect for one another. In Miyazaki’s films, the female leads have separate stories from the male leads, stories that usually highlight their independence, power and intelligence. After recently watching ‘Princess Mononoke’ and reflecting on ‘Spirited Away’ and ‘Howls Moving Castle’, the female villains (Lady Eboshi, Yubaba and Witch of the Waste) are portrayed as powerful and intimidating characters. However, their story lines are explored and, consequently, reveal them as complex characters with understandable reasons behind their actions. So what does this do to traditional notions of femininity? It expands them, and creates characters with more dimension and less stereotypes attached to them. I am also really interested in the notion of cosplay and I additionally want to explore femininity in cosplay and how participants choose to interpret a character in a certain way through their costumes; does it make them feel empowered and confident? What made them decide to cosplay this particular anime? Do they admire these characters? I am attending the Sydney Comic Con this year in September so I hope to answer these questions there. I also want to visit the ‘anime station‘ and ‘artist alley‘ to look at how femininity is represented. For this reason, I am interested in pursuing an independent research project in the form of an essay based on notions of femininity in anime; from films and art to how these animations are translated to real-life scenarios through cosplay. Contacting online fan clubs to initiate discussion on this topic would also be beneficial and interesting to my research. To provide more background on my research I may also look at the historical depictions of females in Japanese styles of art and literature. As interesting as autoethnography sounds, how does one actually go about doing autoethnography? First of all, it is important that one understands the research methods that have been combined to create autoethnography – autobiography and ethnography. Autobiography, at its core, is an account of a person’s life in which the author retroactively and selectively writes about past experiences” (Ellis et al. 2011). On the other hand, ethnography involves a researcher becoming a participant observer in a culture that is different to their own and “studying the culture’s relational practices, common values, beliefs and shared experiences” (ibid). My understanding of autoethnography, essentially the lovechild of these two practices is that an autoethnographer draws upon their personal epiphanies stemming from their own culture, and telling these experiences whilst simultaneously analysing them. Analysis is an absolutely crucial component of autoethnography because without it, the researcher is basically just recounting their life and experiences without any further examination or introspection. And let’s face it, anyone can give a bland and boring account of their life. Analysis further authenticates autoethnography as a research method by forcing the researcher to exercise self-reflexivity and introspectively examine the reason why they feel or think the way they do about a culture that is different to their own. By recounting and critically examining one’s own personal and cultural biases and applying this knowledge to how one understands another cultural group, autoethnography can serve as a therapeutic method of seeking to better understand ourselves and our relationships. Autoethnography can also assist with reduce prejudice and promote cultural change (Ellis et al, ibid). What’s not to love? I am excited to engage in my own autoethnographic research journey when I complete my major project. I would like to examine how my active participation in cosplay and the subculture in Australia has shaped my understanding of Japanese culture. I also plan to interview my grandparents, who know very little about cosplay, to gain a deeper understanding of how understanding and perceptions of Japanese culture can be shaped through exposure to the cosplay subculture in Australia. Ellis, C, Adams, TE, & Bochner, AP 2011, ‘Autoethnography: an overview’, Forum: Qualitative Social Research, vol. 12, no. 1, pp. 1-12. I’m sure many of you know what cosplay is (merging of the words ‘costume-play’), but how many of you know where it comes from and how far it has actually come? The past week I have been looking into the history of cosplay culture and let me just say, I was surprised to find out that the first ‘sighting’ of a cosplay costume was wayyy back in 1939..and in America?! Forest J Ackerman is thought to be ‘the first’ – dressing in a futuristic costume based on the pulp magazine artwork by Frank R Paul at a world science fiction convention ‘back in the day’. It wasn’t until 1984 however, when President of Japanese ‘studio hard’, Nobuyuki Takahashi attended Los Angeles Science Fiction Worldcon and coined the phrases ‘cosplay’ after seeing convention go-ers dressed up. Since then, it is clear how much this sub-culture has expanded, both in the world of gaming/anime/comic onventions and in everyday life. Harujuku: a famous district in japan known for its cosplaying community. The hobbyist aspect of cosplay is largely recognised through conventions in both America and Australia – however, in Japan cosplay goes further than just an element of conventions. Cosplay has become a significant part of Japanese culture. With Akihabara (a city in Tokyo) considered an otaku cultural city. Otaku is a japanese term for people with obsessive interests and it has predominantly shaped the business and buildings of the area as Japanese Architects have designed the stores of Akihabara to reflect the general desire of many otaku to live in an animated world. Fast forward from the conventions of 1938 to today, a technology centered global community. We have social networks and websites based on cosplay activities, along with Internet forums that allow cosplayers to share stories, photographs, news, etc. 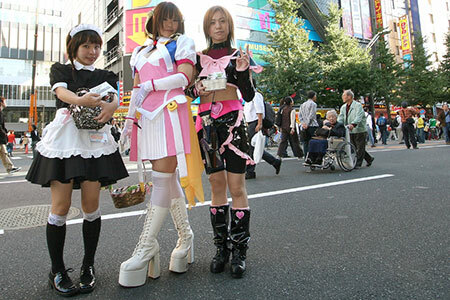 The rapid growth in the number of people cosplaying as a hobby has made the phenomenon a significant aspect of popular culture. One of the biggest cosplaying magazines in japan Cosmode has a digitally adapted website version in English to allow different countries are able to come together to share experiences. Cosplay influenced Japanese ‘maid cafés’ are another example of how this sub-culture has expanded globally to countries such as China, South Korea, Taiwan, Australia, Hungary, the Czech Republic, France, Mexico, Canada and the United States. By making myself a primary participant in my research of cosplay I feel as though my autoethnographic approach will be significantly enhanced. Making a video documenting my own engagement of cosplay costume creation and relating it to additional research will reveal both my personal experiences and observations about the subject and an even further critical reflection of my findings. Looking first at the Cosmode online website– it was apparent that it had not been updated since 2009, although all of the content uploaded prior to that seemed fairly consistent. I then decided to look into the Cosmode Thailand website – even though I can’t understand much of it at all. To be honest, it is what I expected. Much like any other magazines online website it shows you the top articles, front page spreads, directs you to social media pages and has a fair bit of Asian advertisements. What I loved was the visual aspects; cover models dressed in costumes I have no idea about but can’t help but adore! Advice on how to do ‘cosplay make up’ really caught my attention and the bright colours made it impossible to look away! From there I was directed to their ‘webboard’ which was actually their Facebook page. Immediately I was impressed by the most recent post – an upcoming Japan fiesta in Bangkok! A ‘music festival’ with j-rock and cosplay! With a ‘cosplay-break the record’ element (check the video!) which I can only imagine is trying to break some kind of record seeing as I can’t exactly understand what is going on but i did recognise the ‘Tag #JFestacosplay’ which I thought was pretty interesting so of course, I headed to instagram to check it out! With 135 posts so far the hashtag seems to be going fairly well with some amazing costumes although I did make one fairly stereotypical observation; the majority of them are female, and selfies (although I will be exploring that more later). 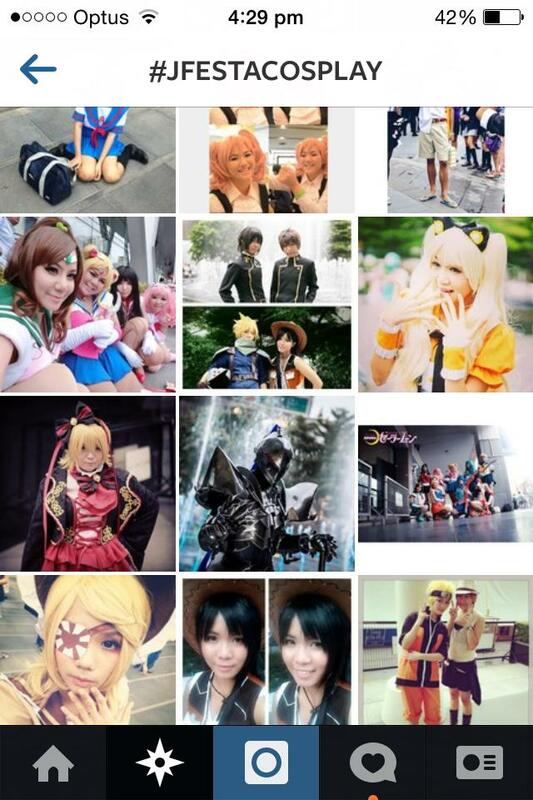 For now, I feel as though this is a prime example that reveals how much the Japanese sub culture of cosplay has grown and influenced elements of other Asian countries as well as westernised countries through conventions and online extensions. Excited to share with you my further research into this extremely broad and wonderful world! After doing a WHOLE lot of research and being extremely confused about my digital artefact choice I came across a Japanese game which re-defined my whole concept. Originally, I had been looking for images of Japanese Samurai in the Sengoku period (16th century), which was known as the ‘warring states period’ and characterised by social upheaval, political intrigue and near-constant military conflict. Funnily enough, this is the time in which ‘Assassin’s Creed: brotherhood’ was set and I wanted my design to be as fluid with this time as possible. In my research, I came across a video game released in the same year as ‘Assassin’s Creed: brotherhood’ (2010) but by Japanese game developer Capcom. It is called ‘Sengoku Basara: Samurai Heroes’. Set in the Sengoku period (16th Century Japan) it incorporates both Japanese Samurai warriors and Japanese production elements into it …WIN! 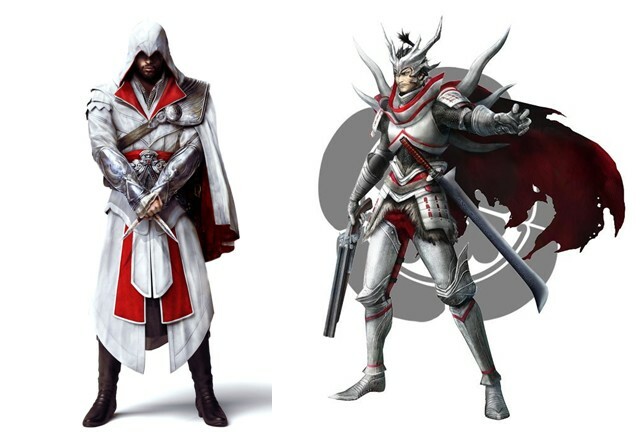 Looking further into this game I realised similarities between one of the characters (Oda Nobunaga) and Ezio from Assassin’s Creed. With their clothing both reflecting elements of their country of origin; Ezio, with the classic Roman robes and Oda, with traditional samurai-like armour, I decided to merge both of these outfits for my final artefact. With the incorporation of Japanese history into the game along with the obvious Japanese influences in the animated production, the discovery of Sengoku Basara will allow me to adapt my take on cosplay to a more digitally Asian perspective. I have obviously been set back a week due to my discovery of this game but next week I hope to delve deeper into the culture of conventions and where this art of ‘cosplay’ came from. FUN FACT: Oda Nobunaga was an actual powerful Samurai and warlord in 16th Century Japan and has also appeared as a character in games such as ‘Pokemon Conquest’ (Nobunaga – The warlord of Ransei). As my autoethnographic research will be looking into the culture of cosplay, specifically gaming cosplay I thought it fit to base my research around my own first hand account of an Assassin’s Creed cosplay costume creation. As a non gamer I feel as though this may be a little out of my league so in order to successfully portray a characters costume I feel like I need to explore the world of Assassin’s Creed a little more. To do so, I could play the game developed by Ubisoft Entertainment, the third largest game producer in the world… But I’m hopeless at that so I decided to watch someone else playing instead; after all, that’s what the internet is for. At first, I thought I would try out the ‘twitch TV’ website that everyone in this subject seems to be raving about to see if it had anything worth watching, but in all honestly I just couldn’t understand it and I turned back to my trusty YouTube for some answers. Typing in ‘Assassin’s Creed’ I immediately found their official YouTube channel (AssassinsCreed) and began flicking through some videos. 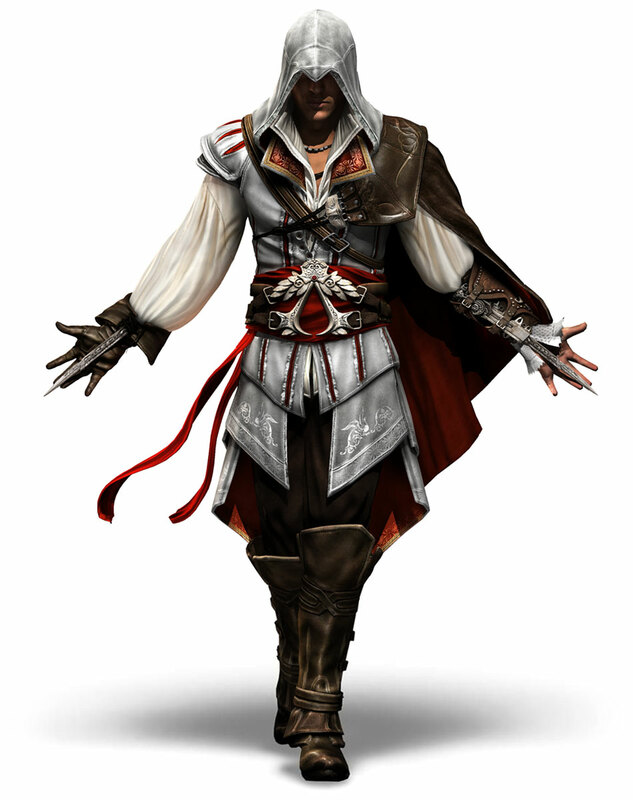 Ezio is the character which I have decided to base my costume on, and after reading his Wiki, I thought I would start by seeing what I could find on ‘Assassins Creed: Brotherhood’ hence the trailer. My immediate thought when I saw this was “um.. Is this an actual movie?” The graphics are so life like that until I actually saw close ups I was a little confused. As I don’t know the full extent of the games storyline, I am still struggling to understand, but from what I have seen it seems extremely action packed with lots of fighting and violence – I love it! Ok, I had to share this. You may think I am totally idiotic, but I never knew that this whole game is based on a guy’s (Desmond) past life memories being exposed! The cinematic features of the game revealed by this let’s play are helping me to understand it more and I feel as though I’m learning so much already! It is sort of reminding me of a more ancient, awesome Avatar, with a much better plot and less blue forest people; mainly due to the whole technology forcing you to experience another world aspect obviously. Throughout my viewing of this, I was in awe at all of the amazing graphics and realism, I still am. No wonder so many people are obsessed with this game! I know I still need to watch the next few parts to fully get the jist of it all but this intro to the world of Ezio has me hooked. This costume creation is going to be harder than I though, because examining Ezio’s costume throughout these videos makes me realise that there are A LOT of specific features which will need to be incorporated and he has many different robes which I will need to consider. I often put a lot more effort than is needed into things like this but I am determined to make it work! Who knows, I might become an avid gamer in the process. – Comparison of the clothing/robes and actions of 16th century Roman assassins within the game with 16th century Asian Shinobi (Ninjas). – New global markets which have emerged and are currently emerging from this culture, and how online platforms are aiding in this expansion. More elements may come to me in the next few weeks as my research becomes more in depth, but for now i’ll leave you with those ramblings and get stuck into my costume design! Feel free to hit me up with any other aspects of cosplay culture you would be interested in reading about! Ones real life identity tends to be irrelevant in the culture of gaming, RPG’s (Role playing video games) such as Final Fantasy, Dungeons and Dragons and WOW allow an individual to portray themselves however they please through their character in the fictional world. Reflect your real life morals or go against them and be someone entirely different – the choice is yours. There are two specific ‘groups’ within this RPG culture, they include WRPG (western) and JRPG (eastern). The western culture RPG’s tend to be more system/rules based with darker realistic graphics, however Eastern RPG’s are generally action/story based with brighter anime-like graphics and intricate plots. Regardless of their cultural differences, role playing video games are peripheral to the art of cosplay in the fact that the characters/identities portrayed in these games are who cosplaying individuals look toward to influence their costume choice. A lot of the time, an individual will develop a bond with their online persona and therefore, it becomes easier for them to reflect this persona in their cosplaying over a character they are not familiar with. An extension of this RPG experience is LARP (live action role play) where a group of individuals dress up and pursue goals within a fictional setting represented by the real world while interacting with each other in character. I see this as like ‘next level’ cosplaying, as they are not only dressing up as the characters, but also choosing to engage themselves in the recreation of the characters identity through role play. A lot of the time, YouTube is the digital media platform which both RPG and LARPers use to express their voices through recording their live action or video game experiences and uploading them for the public to see, as seen below. In addition to this podcasts are used, one group in particular who use this in addition to their YouTube channel is Rooster Teeth. Through viewing and comparing both these forms of role play, it is immediately clear how much dedication and passion an individual puts into their characters. To me, the LARP genre actually helps to break down the stigma created by RPGer’s as the second video reveals the multitude of people who actually get involved. The Rooster Teeth video (to be honest I didn’t watch all of it) does reveal the ‘WRPG’ mentioned by the comparison video through its darker and more realistic graphics. As a non-gamer the detail and customisation actually surprised me but in saying that, the specifications confused the hell out of me! People who actually play this game and understand it, I applaud you because I had no idea! This video also shows how RPG’s allow the option for both male and female characters regardless of your real life gender (Ray has chosen a female panda even though the others chose a male) which is the same when dressing up for cosplay in the fact that you can be whoever you choose to be. Back to the LARP video – I was amazed at the amount of planning and scripting etc that goes into them because before watching this, I honestly thought that they were improvised. The fact that people do this kind of thing on a weekly basis is actually impressive, a further reason why the dedication and passion are so necessary to these gamers life. The strategic and tactical ‘quest’ elements resonate through both the RPG and LARP worlds, and I feel as though it would be one of the main motivations to playing the games. Completing quests, moving up levels and gaining more skills would be super satisfying and ultimately enhance the bond you have with the character.